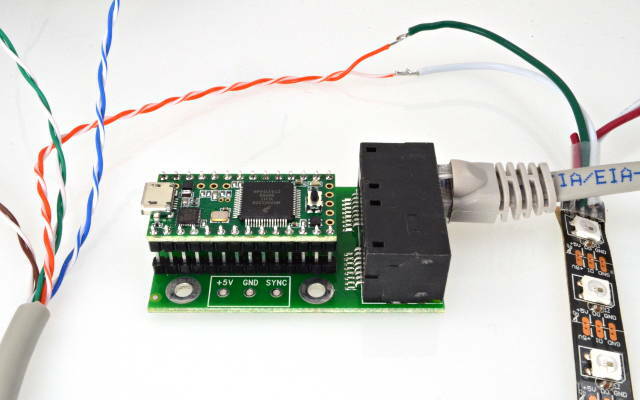 This adaptor board connects Teensy 3.2 to thousands of LEDs using the OctoWS2811 Library. Please note: It is possible to use this board with the Teensy 3.5 and 3.6 but you will need to stack two header rows in order to clear the RJ-45 connectors. To connect more LEDs use multiple Teensy and OctoWS2811 Adaptors with their SYNC signals tied together. To prepare the data cables, simply cut a CAT6 Ethernet cable in half and carefully strip away the outer jacket to expose long enough sections of the twisted pairs to reach all of your LED strips. Each twisted pair feeds the data input and ground of a single strip. For best results, the LED power supply ground and Teensy signal ground should meet at or near the LED strip signal inputs. The LED power supplies should be located at close as possible to the LED strips and connected with large diameter wires, to minimize voltage loss due to high current flow. Do not underestimate the wire sizes needed to deliver power to your LEDs. The most common problem in large LED projects is inadequate power wiring, usually causing flickering or wrong colors. If Teensy 3.2 will be powered by the LED strip power supply, 5V and ground wires should be run together with the CAT6 cables and connected to the +5V and GND pads on the adaptor boards. The 5.08 mm spacing terminal block may be soldered to the adaptor board, or the wires can be soldered directly. Of course, the VIN-VUSB pads on Teensy 3.2 should be cut apart if Teensy 3.2 receives external power, to avoid feeding the LED power back into your computer. 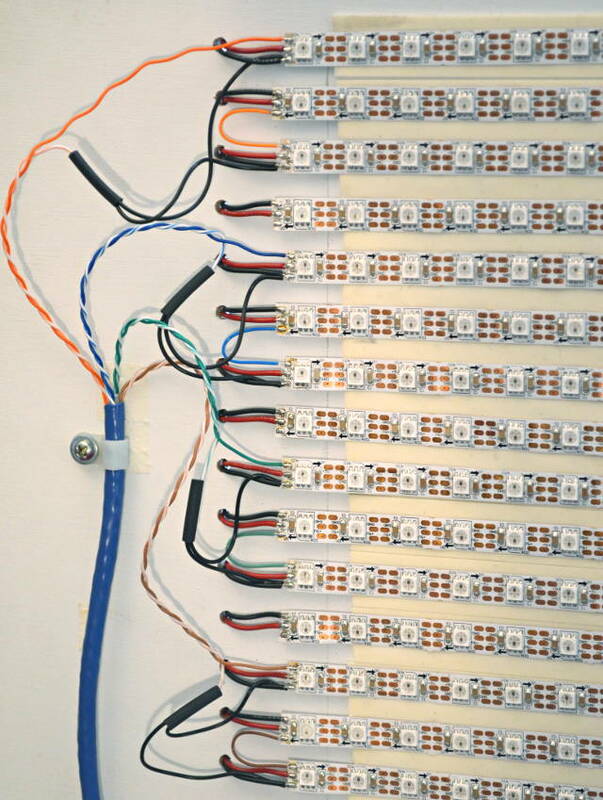 In this example, each OctoWS2811 signal feeds 4 LED strips in back-and-forth rows. The power supplies are mounted to the back side of the display with short, #22 wires feeding power to each LED strip of 60 LEDs. Short, heavy wires for power, with signal and power grounds meeting at the LED strips provides the highest quality signals without signal interference due to the voltage loss along the power ground lines. Together with the OctoWS2811 adaptor's 5V buffer chip and accurate 100 ohm impedance matching to quality CAT6 cable, this wiring style gives a LED project the best quality signal and power delivery.